Moulded parquet rib design acts as a scraper to remove heavy dirt from shoes. Provides an excellent slip resistant surface. Extra heavy base keeps mat in place. Deep raised border holds water and dirt in the mat and not on the floor. Matting which scrapes dirt off footwear in an effective way is essential for keeping the flooring inside a building clean. 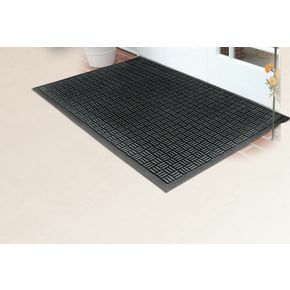 Our recycled rubber outdoor entrance matting removes heavy dirt with ease at the door step, stopping it from being dragged in and soiling your floors. The moulded parquet rib is what makes the matting so good at removing heavy dirt from shoes as the design acts as a scraper. They have a durable recycled rubber construction and provide an excellent slip resistant surface. The extra heavy base keeps the mat in place, while the deep raised border holds water and dirt in the mat; preventing it from going on the floor. There are three sizes to choose from - W x L mm; 600 x 900, 900 x 1500 or 1200 x 1800. Our recycled rubber outdoor entrance mats help to prevent dirt soiling nice clean floors by removing it at the doorstep and they come with a 12 month guarantee.